Are you a gritty, gutsy gambler? Do you like taking business risks, especially when there’s the possibility of making more money than you do today? If so, that may be bad news for your business’s local visibility in Google Places. Sure, you can use your drive and determination to hammer away at trying to get visible in Google Places FAST—but it probably won’t work. Google usually doesn’t reward furious flurries of changes. Rather, the best way to get lasting visibility that actually attracts local customers is to take small, deliberate steps. But you also need to be able to retrace your steps. The steps need to be reversible and low-risk—so that you can see to what extent they actually help your local visibility versus harm it. AKA an experiment. You can build a better local ranking by experimenting with your Google Places listing. I’m assuming your business is somewhat visible, but not as visible as you’d like. 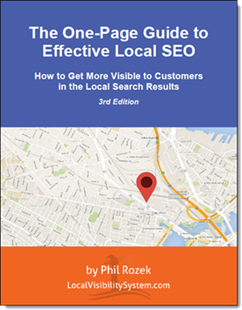 (If you’re nowhere to be found, you have no business reading this and instead should spend time applying the steps in my free guide to local visibility.) Maybe you’re ranked #8 and are just barely missing the first page of local search results. Or maybe your business is pretty visible locally, but for the wrong search terms. These 5 low-risk experiments can help you feel your way to better visibility to local customers. Even though it takes a couple of weeks to “run” most of them to completion, each takes only a minute or two to implement. The best part is you’re not taking a big plunge by trying these experiments: save your gutsiness for the next BASE-jumping competition. See how many of the following you can try out. Why: Picking a new lineup of relevant “Categories” can help you rank more highly for different local search terms—possibly including the ones you’ve been trying to get visible for. How to do it: Log into your Google listing, go to where you edit/update your listing, and change some of the “Categories” fields. When to do this experiment: If you rank poorly in Google Places, or if you only seem to rank well for searches that aren’t completely relevant to you (for instance, if you’re a house painter and don’t rank well for the term “house paining” but do rank well for “paint supply”). When NOT to do it: If you rank well locally (top-7, AKA page 1) for the search terms you want to be visible for. How you know if it works: After a week or two, see if your business is visible in Google Places for terms that it wasn’t visible for previously, or see if you notice a boost in ranking. More detail: If you’ve already selected categories that clearly describe your services or business, keep them. In general, only try changing the “iffier” ones. For instance, try changing 2-3 of your categories if there are some that aren’t spot-on relevant to what you offer, or if there are some categories you chose even though you saw plenty of other applicable ones to choose from. Another way to do this experiment is by selecting a different number of categories. The maximum is 5, so if you’ve already specified 5, maybe try going with only the most relevant 3. Or if you’ve only chosen a couple, rack your brains to come up with 3 more pertinent ones. Not completely sure which new categories to try? Mike Blumenthal’s free, ridiculously excellent Google Places Category Tool might help. Why: You might become visible in slightly different geographical areas within your local market. When to do this experiment: ONLY if you travel to your customers (rather than have them come to your location). Given that, only do this experiment if you’re trying to rank more visibly in a big city but you’re located a few (about 2-6) miles outside the center of the city. Or you can do it if you’d just like to be visible in slightly different specific towns/areas within your local market. When NOT to do it: If you have any really good rankings in Google Places that you wouldn’t want jostled around. How you know if it works: Type in a local search term (let’s say “roofing” or “roofer”) and see how visible you are for it. Then go to the “Change Location” bar on the left-hand side of Google and set the location to another town in your local market (a town that you serve). Type in the search term again and see how you rank for it. Repeat this process for other towns in your local market. Then you’ll know whether you’re visible in the local areas you want to be visible in: if you are, great, but if you’re not, then uncheck the “Do not show my business address” box to undo the experiment. Very similar to experiment #2. All the same conditions apply. As before, only do it if you travel to customers. Everything else I said about #2 also holds true for #3. Under “Service Areas and Location Settings,” simply change the “Distance from one location” or “List of areas served.” No guarantees that you’ll be visible exactly where you want, but this at least allows you to tell Google where your local market is. Try either narrowing or widening your service area. I don’t know your market, so I can’t say for sure which one is more likely to help your visibility. Still, if your main goal is to get visible to customers in one specific town, try narrowing your service area to just encompass that one town. If you serve many local towns maybe try widening your radius by 10 miles. Why: It’s a way of establishing your business as relevant to the services you’re trying to get visible for. It’s another little factor that can help you rank more visibly. How to do it: Go to the “Edit” area of your Google Places listing and change what’s in the “Description” field. When to do this experiment: This is a “finishing touch,” so only do it if you’re trying to bump up your ranking by 1-2 spots (for a given search term). When NOT to do it: If you rank in the top-3 for some of the major search terms you want to be found for: in this case, it’s probably not worth rocking the boat by messing with the description. How you know if it works: You might see a little improvement in ranking. More detail: Don’t just stuff the description full of “keywords.” It still needs to make sense to a human reader. You should only have a couple (2-4) local search terms in the description. Therefore, the “experiment” shouldn’t extend beyond just trying out slightly different search terms in place of the ones you already use: don’t just shoehorn a bunch of additional search terms into that tiny description box. Why: Same reason as #4: another little factor in your favor. When to do this experiment: It’s really never a bad idea, because the “Details” aren’t a big ranking factor, and you can instantly change them. How to do it: Scroll down to the bottom of the “Edit” area of your Google Places page and fill in the “Additional Details” fields with more information about the services or products you offer. You might want to mention your specialties, some of the equipment you use, what types of jobs you do or don’t do, your professional certification, etc. Be as detailed as possible. How you know if it works: Again…your ranking might go up a notch within a couple of weeks. More detail: There’s no limit to how many details you can add: Google lets you include as many as you want. And you should use multiple fields: don’t just slop everything into one. Make sure all the details you add make sense to a potential customer and that they aren’t just a parade of keywords. By the way, jot down every change you make. The experiments are reversible as long as you remember how you had your Google Places listing before. Are we all nice people?‎: Yes we are! Do I want to be your eye doctor?‎: I sure do! There must a reason why Google picks which item to show. An experiment could be done by listing things alphabetically and seeing how Google makes its choices. That’s a *great* experiment idea. Thanks for the suggestion. Didn’t think of it, but I have wondered about how they rank the “Details.” Maybe they show them in the order in which you filled out the “Details”: when you’re logged into your Google listing, I wonder if those two fields show up at the top of the long list of Details you’ve specified. Definitely worth an experiment and another post! Great blog post Phil. I have applied to what you have stated on previous emails and had a top 5 ranking now I don’t appear at all on the first page so I thought I need more insight so I looked for your blog to bring me “up to speed” on what was new with Google Places. Based on your helpful information I have implemented a few things and hoping they will work out. thanks for the compliments! Glad the suggestions have helped–and I hope they help you clear this latest hurdle from Google. Let me know how they work out. Can you have geographical terms in the business description? I have a Places listing (not yet active) that Google lists as “does not comply with our policy of allowed terms”. Its not active but has all my info in it . . . what’s up? But it’s OK to include geographical terms in your business description. Obviously, don’t STUFF the description with city names: a good rule of thumb is don’t mention more than 2-4 specific cities you serve. As long as the business name is free of geographical terms (although it’s fine if they’re part of your DBA), you shouldn’t run into any problems. Is there a problem if you notice that your tickers aren’t working? I mean the two sections that calculate your impressions and the actions taken. I just got the postcard back and filled in the code and it is up and running again. How important if at all, is it to have a video attached to the page? And I’ve heard that the video title should have your keywords in it, is that true Phil? Google’s tickers (AKA the “Dashboard” stats) are notoriously unreliable. Sometimes your stats don’t show up even when you did everything right, and sometimes they’re just not accurate at all. IF your listing is new, the stats won’t show up for a while. But if you’re talking about a listing that you’ve had up for a while and your tickers all of a sudden go flat-line, then it’s probably just Google dropping the ball. Either way, all you can do is wait and see. It’s good if you can have a video attached to your Google listing. As you probably know, you have to upload the video to Youtube before you can add it to your Google listing. And yes, you’ll definitely want relevant keywords in the title, but just don’t go overboard: it should look natural to a human. Youtube rankings depend largely on views. So if there are too many keywords and it looks “spammy” to a person, you won’t get many views, and your video will tank. Well said Phil. Sometimes its really tough to understand the Google tricks about their placings.Even though we did the listings in right way we miss the placing on 1st page of Google. Your article has explained in a greater way for us to take care of certain areas while listing in Google. Glad you liked it–thanks for the feedback! I’d love to hear any ideas you might have for other experiments worth trying.